Today I came across the notes from a travel writing class that I took last June. Feeling a need to regain some sanity in the mix of the hustle-bustle of late, I decided to spend the day writing a few more stories for my memoir and using some of the tips that my writing instructor shared. I continually add to my memoir by writing short-stories of 500-1500 words that are based on my experiences or observations. 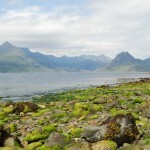 This one happens to be of our day on the Isle of Skye back in June 2010. If you ever get an urge to travel, I would highly encourage you to consider Scotland. Here goes my story, Travels with Crayolas. I’ve included a few photos to accompany this story. Enjoy! Crossing to the Isle of Skye from Rosshire seemed like we were entering a magical, fairy-tale world. During my childhood, I had relished tales of Scotland from my Grandpa Horace McLennan. While he never journeyed to Scotland, his father, Lachlan, immigrated from Lochcarron in 1869. Thus, Grandpa heard many a tale from his father, including what likely were heavily embellished stories and quite characteristic of good Scottish storytelling. As I gazed through the windshield, the colors of the day’s journey reminded me of my Crayola crayons that accompanied me to grade school each fall. In fact I close my eyes now and think back to June 29, 2010, with the range of colors that Steve and I discovered on the Isle of Skye. First to greet us was the Highland bagpiper with his tartan of blues and reds. 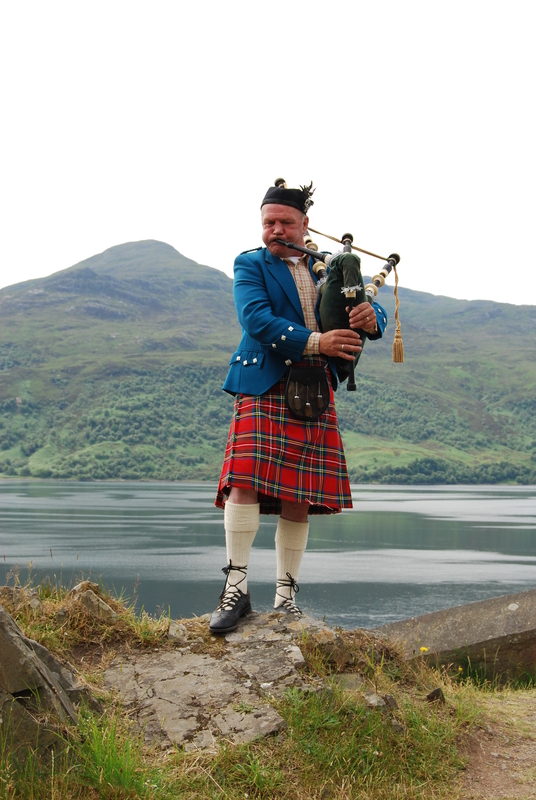 He played mournful tunes near the mainland side of the Skye Bridge. 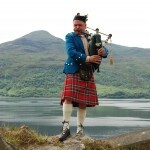 We pulled off to admire the songs with their full sound emanating from the bagpipes. In response to my presence, the piper shared a friendly smile between tunes, but offered no conversation. I quickly realized that this gentle soul was blind. Adhering to a customary and respectful gesture, we left some coins in the plaid hat at his feet as a thank you prior to requesting a photo. Behind this gifted musician, the purple heather and spikes of Scottish thistles grew in clusters and clumps. Tarrying no longer, Steve and I continued our journey over the sleek toll-free bridge as it crossed the deep blue Kyle of Lochalsh. Stark white dots moving along the green pastures were recognizable as the all-too-familiar grazing sheep. Countless times during our 10 days in the Scottish Highlands, we frequently waited for these fleecy creatures to clear the road in front of our compact rental car. 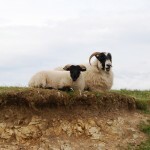 Admittedly, I couldn’t help but feel pensive by their presence for they were a sad reminder of the Highland Clearances that prevailed in the 1800s, where the land lords found they could reap more money from raising sheep than their poor tenant crofters could make for them. Many a Highland crofter and his family were forced from their meager means to flee to larger cities for work or to seek a new life in a foreign land, such as my McLennan ancestors did. 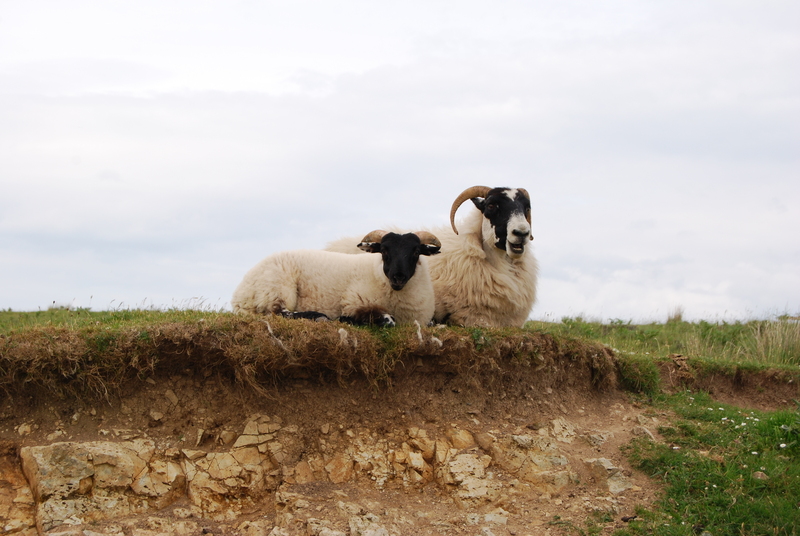 As we made our way on the gray, winding and narrow road, we came within feet of the sheep, with their bellowing BLEATS. I continued to mentally select crayons from the Crayola box of my childhood as we drove through the rocky hills of the Isle. 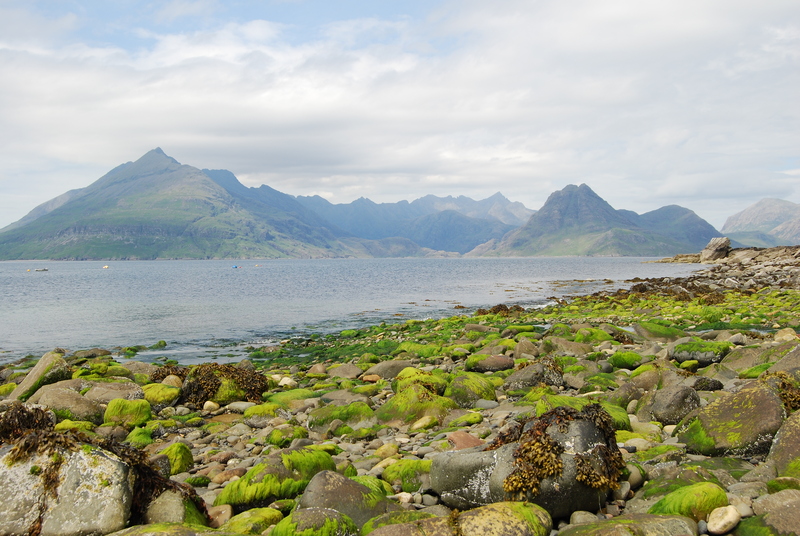 In Elgol Along the Sea, I stood on the rocky shore with its smooth yellow-green seaweed covered rocks. The fresh sea breeze swept my black bangs from my forehead, letting the gold sunlight warm my skin. Light-blue seal watching tour boats with red trim created V-ripples behind them in the teal salt water as they approached the small weathered pier. On the horizon, the Cuillin Hills stood grandly with their deep shadows and forest green hues enhanced by the overhead clouds. In the cold water at my feet, the Cuillins’ shimmering reflections joined those of the brilliant sky blue heavens and meandering white clouds, causing me to pause in awe. Stepping carefully from one slippery damp stone to another and avoiding several colorful purple and rust jelly fish, I peered into the clear tidal pools to see tiny red-orange crabs feeling their way with crustacean pincers through the tan granules of sand. Were they in search of dinner? White and gray cawing sea gulls certainly were. Though they playfully swooped in wide circles above Steve and me as the incoming wind currents urged them upward toward the azul sky over the little village. Looking at the hillside community that laced back and forth across the hill, I could see a few cozy cottages of white-washed stone. Even in late June, dark gray curls of smoke wafted from one of the blackened stone chimneys, likely from a peat fire used to remove the chill of its stone interior for the family. Along the pier was a dozen neatly stacked lobster traps with bright orange netting, dull silver linked chains, black and white buoys, and a few stray strands of silky green seaweed clinging to the buoys. The traps were ready for the next day’s trip to harvest lobsters from the sandy sea floor. Surely, coast side eateries would quickly serve them up to diners for a hefty price. Making our way from sea level up the inclined 25%-grade road, we lingered for a moment so I could capture a rather humorous snapshot. Looking as if it stopped in its tracks with a final load, an old blue Land Rover pick-up truck with dimpled dents was parked along the road side. The black tires had thick heavy-duty treads ready to handle a nasty winter storm or a rugged Highland road. The back wheels rested in a pile of chalky gravel, perhaps truly its final load after years of toil. Poor “Old Blue” as I would have named him. Along the nearby ditch, a stony-gray fence about 3 feet high and created from the rocks cleared from the pastured fields followed the road. 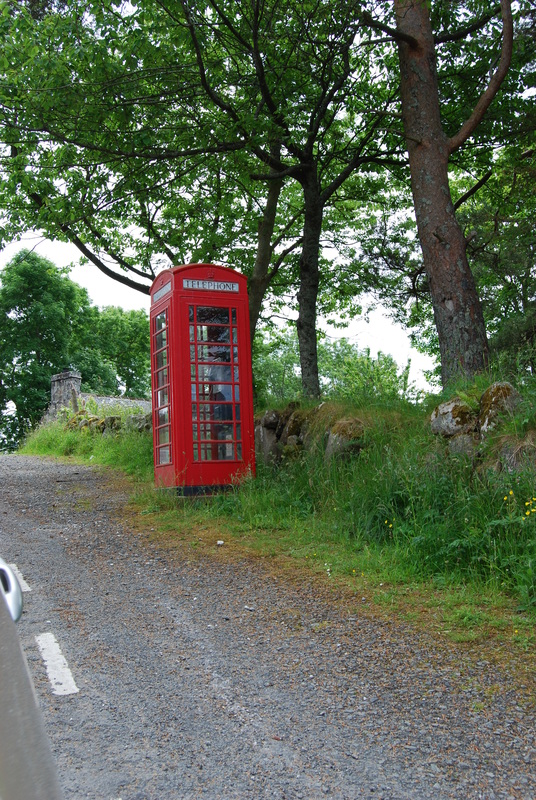 Heading inland and in a remote place between villages, we approached a bright red telephone booth along the roadside complete with a gravel pull-out. There was nary a home, business, or soul nearby, simply this pause in the landscape to offer a quick phone call to a passing motorist. 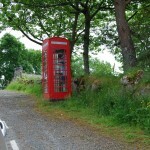 It seemed such an oddity to encounter this funny sight, but it was one that was repeated throughout the Highlands. 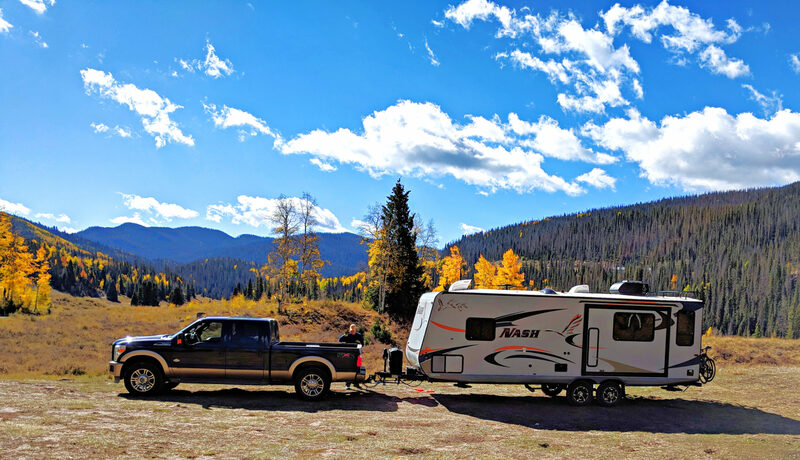 We were reminded of the comforts of home to which we’d grown accustomed in a country filled with infrastructure and ease of communication. Desiring a hike on the Isle of Skye, we read about the custom of being free to walk or hike wherever one would like. The only stipulations are that the hikers not disrupt the livestock or the vegetation. My berry red camera case in hand, I wound through the passage gate and followed Steve on the rugged footpath. The Cullihin Hills still in the distance served as our horizon marker. Certainly we could walk for the nearly 10 miles and reach them! However, being ones who like to stop for flora and views (or perhaps I should clarify that my shutterbug tendency creates the need to stop), we managed to walk a mere 2 miles due to a lack of time. Two outstanding highlights were experienced by Steve and me, and needed to be photographed: delicate purple heather juxtaposed against angled rocks and the light brown strand of an inlet where a white seaside home stood below us. Upon completing our short trek and with stomachs growling from hunger pangs, Steve and I drove winding A87 to an equally picturesque location on the Isle, that of Sligachan. The Sligachan Inn sported Seumas’ Bar. Perfect for wayfarers, it was brimming with laughter, music, warmth from a fireplace, and the amazing scent of food. Steve and I ordered what served as a perfect late lunch. 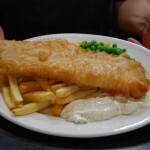 One large battered fillet was served, gold and crispy, and definitely delicate to the palate. Scooped along-side the fish was a generous helping of bright green peas, cooked to perfection, which means not mushy in my book. 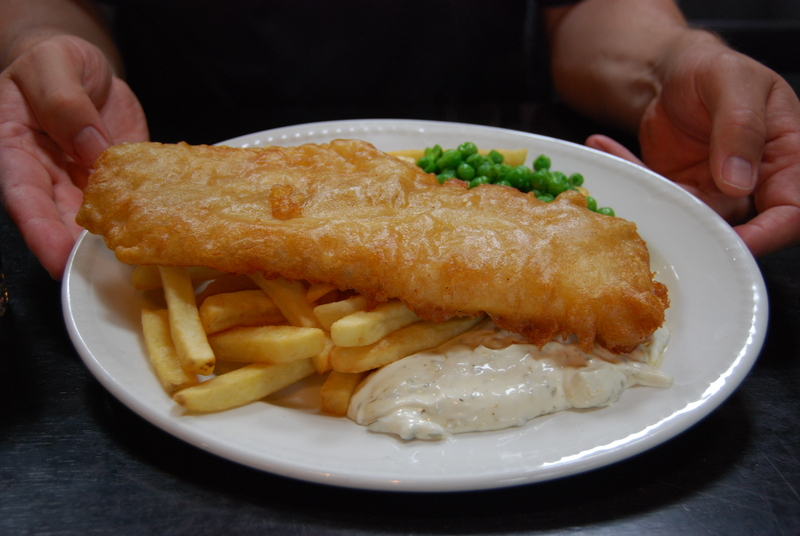 The thick golden chips had the same nice texture on the outside as the fillet. Sprinkled with a little dark vinegar, our lunch was one that we continue to recall to this day! Alas, it was time to bid farewell to this magical Isle. After crossing the Skye Bridge and driving through Plockton, we were halted by a small herd of massive Highland cattle with their long mangy burnt-orange fur and wide-spanning horns. Like the annoying sheep, we couldn’t budge until they lumbered from the road and into the ditch. 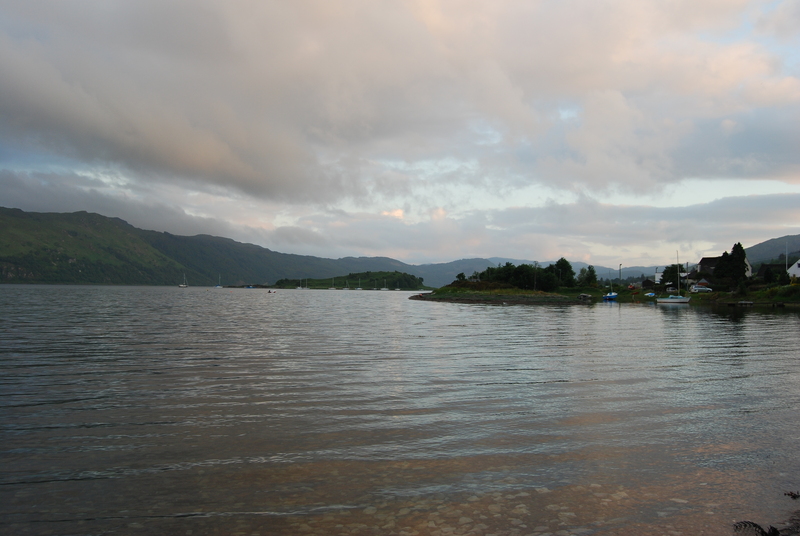 Our route took us around the gentle curve of Loch Carron. A monochromatic scheme of blues seem to fill all of the spaces between the water, the landscape, the mountains, and the sky. 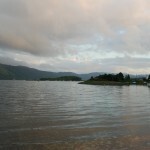 Twenty minutes later Steve pulled into the parking space at the Old Manse Inn in Slumbay along the shores of Loch Carron. The tide was gradually advancing. The evening began to cast its hushed and lower light resulting in a pastel palette that broke free from the range of blues. Hand in hand, we stood and watched as pink, peach, periwinkle, and violet crept into the sky above us. Then the twinkle of lights in cottage windows through the village of Lochcarron became evident, one by one. At that moment, I felt like I was carefully placing each one of my crayons back into my school bus gold and hunter green cardboard box with the word Crayola stamped on front, back, and top. With their waxy tips pointed up and placed in a neat row, I whispered a thank you for the many colors of the day. Then as I’ve done a multitude of times, I tucked the flap inside, closing the top. I set my Crayola box aside until I could break them free once again to cast their brilliant hues across the Highland landscape as we continued our color-filled journey. 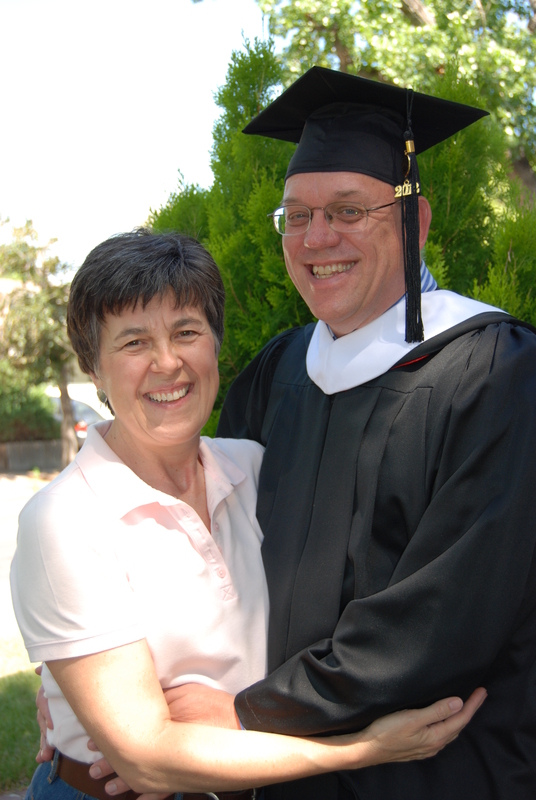 This past Friday, busting with admiration and filled with thanksgiving, I watched my husband, Steve, graduate with his Master of Art degree in Conflict Resolution. Do you ever feel like you need to be pinched in order to double-check reality? The need for pinching really began when Steve slipped on his black commencement regalia with the folds draping to mid-calf and then added his colorful academic collar, its crimson and gold satins representing the University of Denver and the soft white fabric edge designating the Josef Korbel School of International Studies. From our rented bungalow last Friday, we walked to campus hand-in-hand together down Asbury as we have done countless times over the past 22 months. This time I was plodding along in uncomfortable shoes and at a much slower pace than usual, feeling the need to be pinched back to reality. Dressed in a long-sleeve shirt and dress slacks, Steve was baking in the abundant sunshine with perspiration beading on his forehead, carrying his regalia draped over one arm. Our conversation was hit and miss, likely because we were both focused on this moment, which always seemed to be embedded in the future, but was now 60 minutes away. For me, my tears of pride and relief seemed to hide just behind my eyelids, though could easily streak down my face with very little prompting. Once on campus and in the shade of a young tree, Steve donned his regalia, posed for the requisite photo from this endearing fan, gave me a quick kiss, and walked toward the graduates’ entrance. Walking alone to nab seven seats for our family, I saw other excited graduates heading for their entrance. Along with me were parents, grandparents, and likely other spouses and children filing into Magness Arena hoping to find prime seating. Feeling overwhelmed by the number of people already in seats, my quick reaction was to simply stop and ask a kind usher where I would find a good spot for myself and six others to watch my husband graduate. He pointed to a section that seemed to repel people for very few guests were seated there. Most people were packing into the auditorium directly behind where the graduates would be seated. I slipped through the crowd, walked to the sixth row of the sparsely populated section, and easily grabbed enough seats for our family. Through the wonders of texting, the rest of the family joined me as if on cue. The usual pomp and circumstance filled the arena that was thick with black robes, colorful academic collars, and great anticipation. The graduate candidates filed into the arena while families shouted and cheered from the surrounding sides of the arena. Those of us with cameras behaved more like the paparazzi as flashes flickered repeatedly. Amazingly, Steve’s college was seated in front of our section, so we could not have planned our seating arrangements better. The big screens that hung from the arena’s ceiling were a perfect way to see the graduates who one by one stepped forward to be congratulated with handshakes. When the name “Steven Felt” was called out, our entourage of seven gave a shout out to him. His smile reached from ear to ear as he moved the 2012 tassel from one side of his black mortarboard to the other, signifying the rite of passage from Master’s Candidate to Master’s Graduate. In a blink of the eye, he was off the stage, back at his seat, and waving to us. Celebrations go hand-in-hand with graduations. We attended a recognition reception last Thursday and a morning breakfast on Friday. The open house that we hosted on Friday evening directly following graduation was a fantastic time to say thank you to family and friends who gathered to help us rejoice with Steve on his wonderful accomplishment. We are especially grateful for our family for their support: our son, Jeremy; daughter-in-law, Michelle; daughter, Stephanie; son-in-law, Shane; and, Steve’s Mom, Lois. Now, with great joy and gratitude, Steve and I find the corner of the final page of this chapter of our book, carefully bringing it to the left to join the preceding pages. Time to pause, reflect, and begin our next chapter.